RAWALPINDI: The Pakistan Army has been ordered to retaliate against any action by foreign troops inside the country, Geo News quoted ISPR spokesman Maj Gen Athar Abbas as saying on Thursday night. Shakil Shaikh adds from Islamabad: Pakistan’s military commanders resolved to defend the country’s borders without allowing any external forces to conduct operations inside Pakistan. A spokesman for Pakistan’s army, Major Murad Khan, has slammed Washington for killing Pakistani civilians, warning of retaliatory action. “Border violations by US-led forces in Afghanistan, which have killed scores of Pakistani civilians, would no longer be tolerated, and we have informed them that we reserve the right to self defense and that we will retaliate if the US continues cross-border attacks,” Khan said in an exclusive interview with Press TV. His warning came after US forces launched cross-border attacks in tribal areas in Pakistan’s North Waziristan, killing at least 20 civilians and wounding 25 others on Monday. PHILADELPHIA (AFP)—The Democratic White House hopefuls vowed Wednesday to defend Israel against any Iranian attack but differed on how to engage the Islamic republic over its nuclear ambitions. 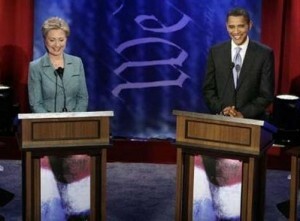 At a televised debate ahead of next Tuesday’s Pennsylvania primary, Hillary Clinton and Barack Obama agreed that a nuclear-armed Iran was unacceptable. Both called for diplomacy but Obama went further in renewing a promise of “direct talks” at a leaders’ level with Tehran, along with other US foes. “We cannot permit Iran to become a nuclear weapons power,” Clinton said, ruling out any summit talks and condemning President Mahmoud Ahmadinejad for raising doubts about who really carried out the September 11 attacks of 2001.